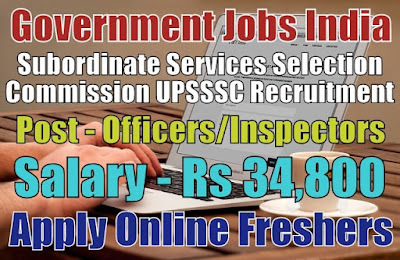 Uttar Pradesh Subordinate Services Selection Commission UPSSSC Recruitment 2019-20 (Ministry of Defence, Government Jobs in India) notification for 672 officer and inspector posts. All legible and interested candidates can apply on or before (19-02-2019). 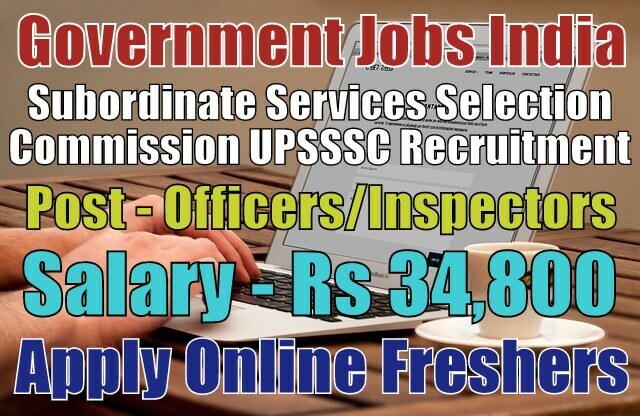 Further information about the Uttar Pradesh Subordinate Services Selection Commission recruitment 2019 courses and exams, vacancies, salary details, UPSSSC news and jobs list and careers, result, application fee, UPSSSC government jobs in India, educational qualifications and all other details/information about these posts are mentioned in details below. The total number of vacancies are 672. 7. Revenue Officer - 26. Salary/Pay and Grade Pay - For posts(1-3), the payable salary will be Rs 9,300 - 34,800 with Rs 4,200 grade pay and for posts(4-7), the payable salary will be Rs 5,200 - 20,200 with Rs 2,800 grade pay per month. Further information about salary details is mentioned in the detailed advertisement. Candidates have to register themselves online. Candidates have to apply via online mode only. Applications sent via offline mode will be summarily rejected for sure. The online registration for this recruitment is starting from (30-01-2019).